An assistant professor who doubles as a Karate trainer is teaching women self-defence on the campus, has been recognised by the Karate Association of India for promoting the martial art. 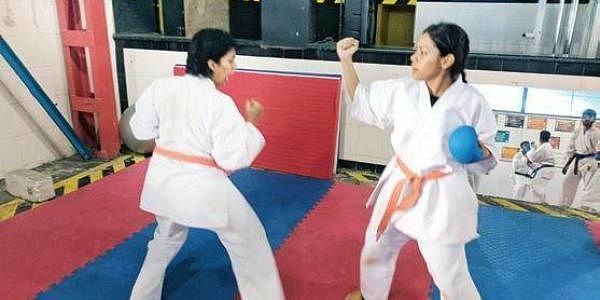 BENGALURU:An assistant professor who doubles as a Karate trainer is teaching women self-defence on the campus, has been recognised by the Karate Association of India for promoting the martial art. Mathews P Raj, 29, an assistant professor of the department of Life Sciences at Jain University, Bengaluru has been conducting self-defence classes for the university’s students, as well as staff on the JC Road campus since 2012. While a few students are trained only for competitive karate to participate in tournaments, many girls and women are trained in self-defence, which includes a lot of mental training too. “The course lasts from six months to an year. Basically we train their minds and teach them how to act and behave in critical situations. They are even taught to defend themselves while wearing a saree,” says Mathews, who himself began learning Karate in 1992, when he was in class II. In 2015, Jain University signed an MoU with the Karate Association of India, by which the varsity’s team gets direct entry in national karate competitions and competes as a special team. As of now, Jain is the only Indian varsity to promote Karate and self-defence. Mathews’ organisation - Wakayama Karate Do India, has conducted corporate training programmes, self-defence camps on the occasions of women’s day, one-off workshops lasting three to four hour in corporate sectors and schools. A CD of a video demo for women was made by the TCS group and the CDs were distributed to all women employees of TCS in India.